Today we’ve reviewed one of the best electric milk frothers on the markets Secura. If you love frothy foam in your coffee keep reading and find out is Secura good for your needs. 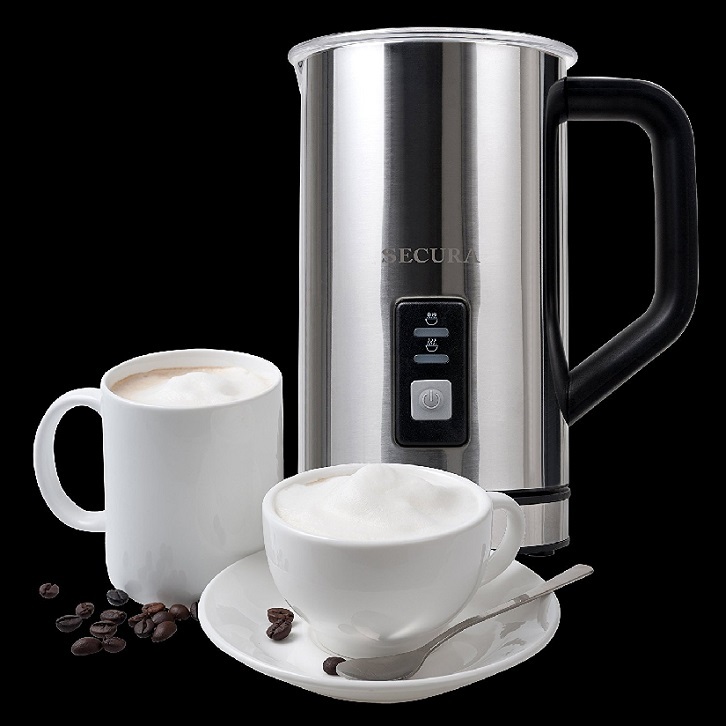 This Automatic Electric Milk Frother and Warmer made by Secura provides you with both hot and cold milk froth, ideal for your cappuccinos and it also heats the milk for lattes. It comes with a two-year warranty and it is built to North American Electrical Standards (120V). Maximum capacity when it comes to froth preparation is 125 ml while the maximum amount of milk you can pour for hot milk preparation is 250 ml. Both maximum capacities are shown by two milk level indicators. The upper-level indicator shows the maximum amount of milk for the warmer while the lower one refers to the maximum level mark for milk frother. Obviously, the difference between those two amounts comes from the fact milk volume expands after frothing. There is also a minimum milk level mark – be sure not to turn on frother without the minimum amount of milk in the cup. Secura milk frother weighs 2.4 pounds and its dimensions are 7.6 x 6.2 x 5 inches. Its exterior is made of stainless steel and it has the vacuum insulation, as well as the detachable base. The interior has the Teflon coating, and it comes with a free cleaning brush. 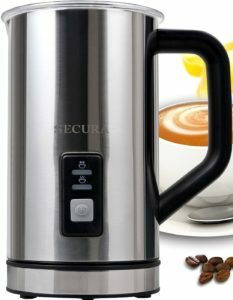 * If 250 ml is too low capacity for you, Secura has also released Automatic Electric Milk Frother and Warmer with the capacity of 500 ml for hot milk preparation and 250 ml for froth preparation. Dimensions of this product version are 8.9 x 6.4 x 5.3 inches, while it weighs 2.7 pounds. For hot drinks preparation press the ON/OFF button once and release immediately. In this case, both heater and frother will turn on. For cold drinks preparation, you should press and hold the ON/OFF button for 3 seconds. In this case, only the frother will be turned on, while the heater won’t. Before pouring milk into the device, be sure to have checked if your milk is fresh since the milk frother relies on the protein in the milk when it comes to producing foam. In other words, the old milk’s protein decomposes even before the expiration date – therefore, the foam produced may not be as good as the foam of the fresh milk. In the worst case, it will be completely impossible for the machine to produce milk foam. When making hot froth in Secura..
Make sure to put the frothing whisk in place and short press the ON/OFF button only after you’ve filled the unit to the max fill line for frothing. Release the button immediately. At that point, both red and blue indicator will turn on. When the milk is ready, the red flashing light will show you the milk is prepared. As long as you clean it right after pouring the froth or milk, the cleaning process of this frother is as easy as its usage – just pull out the whisk after the usage and run it under hot water to get all milk off. The inside space can be cleaned and rinsed by a soapy sponge because of the Teflon coating. The brush that comes with the frother can be used for cleaning of the removable frothing ring. The machine should not be submerged nor washed in a dishwasher. It is a fast, quiet and completely automatic device built of the high-quality material, with stainless steel exterior and Teflon interior which provides easy cleaning. It works perfectly with soy milk, almond milk, and whole milk. With hot and cold options, provides excellent froth and it is pretty simple for use while keeping the exterior cool to touch. Another great thing about it is related to the safety of usage – when the milk temperature reaches the maximum heating level, the device automatically shuts off. Finally, you’ll be able to enjoy your frothy milk in basically no time – it takes less than half a minute for it to be ready. The only flaws of this machine are related to its cleaning – a thin layer of burnt milk remains at the bottom after heating and the frother cannot be submerged in the water. One more potentially bad aspect refers to the material of the bottom of the jug – the bottom of the Secura jug has a metallic contact exposed which may not be good if you accidentally get the bottom wet. Being compact, quiet and easy for use, yet pretty affordable, Secura Automatic Milk Frother is a great device for preparing both heated milk and hot and cold milk froth; it is not rated as the best value frother on many lists of best frothers without a reason. It has a large capacity priced less than some other competitive frothers, still providing you with great quality.